Helps to improve regularity, increase heart health, and maintain healthy blood-sugar levels with its soluble and insoluble fiber formula. NuMedica Fiber Factors is a great-tasting formula that features soluble and insoluble fiber to enhance regularity and support your intestinal functions. This easy-to-mix formula is ideal for the relief of periodic constipation. This nutritional supplement promotes bowel regularity and helps maintain healthy intestinal activity. Fiber is an essential part of a healthy diet. If you don't get the fiber you need on a regular basis, you may suffer irregularity. Moreover, fiber also helps promote healthy cholesterol levels and supports overall heart health. There are two types of fiber and, for optimum health, you need to have both. Soluble fiber dissolves when mixed with water or swells just like when you add water to oatmeal. Soluble fiber is known to reduce bad cholesterol levels and is also associated with stable blood-sugar levels. Insoluble fiber does not dissolve in water. It is essential for providing bulk to stools and increasing regularity. Examples of soluble fiber include beans and fruits. When you get busy, as most of us do, you may skip a few healthy, balanced meals containing the essential fiber you need. 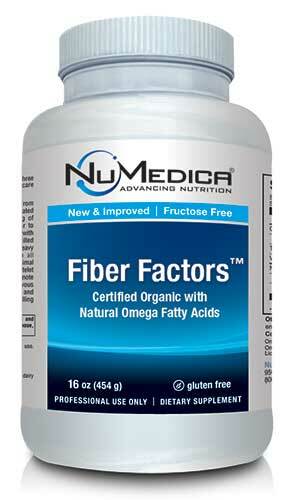 NuMedica Fiber Factors ensures that you get this important fiber even when your diet doesn't provide it. Studies have shown that fiber supports healthy blood-sugar levels by slowing your digestive tract's breakdown of carbohydrates. This delayed process ensures that the release of sugar into your system is also slowed. Researchers have also found that a fiber-rich diet is linked to a 40% reduced risk of heart disease. Fiber may also contribute to a reduced risk of stroke. If you are trying to lose weight, a fiber supplement helps you to feel full so you are less likely to eat between meals. With plenty of fiber in your diet, you may also reduce your risk of diverticulitis and also more effectively ward off acne, hemorrhoids, and gallstones. Mix 2 1/2 tablespoons into at least 6-8 oz. of water or juice, and blend or as directed by your healthcare practitioner. Be sure to drink plenty of additional fluids throughout the day. Start with smaller amounts and gradually increase to full serving size over several weeks. Use once or twice daily for optimal effect. Ingredients: Golden Flax Seed Meal (certified organic) (cold-milled), Gum Acacia (certified organic), Inulin (certified organic) (FOS). Not Manufactured With: Yeast, wheat, gluten, soy, milk, egg, fish, shellfish or tree nut ingredients. Storage: Keep refrigerated after opening. 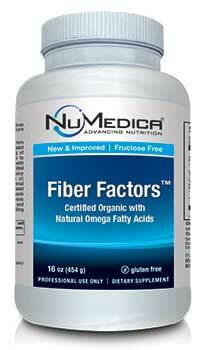 NuMedica Fiber Factors (New & Improved) - 16 oz.